Yeovil have failed in their bid to re-sign Portsmouth goalkeeper Asmir Begovic on an emergency loan. The Bosnian-born Canadian, 20, was recalled by Portsmouth from his initial one-month loan to sit on the bench against West Ham on Tuesday night. 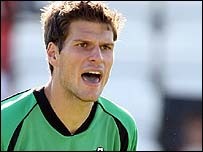 Glovers manager Russell Slade told BBC Somerset that FA rules make it hard for Begovic to return to Yeovil. "Problem is, we have a keeper here already and we'd have to do it on medical grounds," Slade explained. "We just play on, take it on the chin and you've got to think what you can do to solve it rather than moaning about it. "Thinking that you're hard done-by doesn't get you anywhere." Darren Behcet, 21, who signed for Yeovil on a free transfer from West Ham in 2006, could make his Football League debut against Crewe on Saturday if first-choice goalkeeper Steve Mildenhall fails to recover in time from a long-term knee injury. "The fact is, Darren's fit enough and we've already got Mildy back in training so it will be between those two who starts," said Slade. "What I will do, for insurance and cover, is whoever I decide to start with, the other keeper will be on the bench which will be unusual, won't it?"